In Jessica of Feltgood's words...Feltgood is her new craft label - specialising in gorgeous wheat bags and anything cute! Cute, her items definately are, but better, they're functional. No plain shaped wheatbags here, think fun 'huge eyed' owls, weeny 'red robin' hand warmers, and the loooonnngg Steven and Stanley sausage dogs - perfect to wrap around your neck. 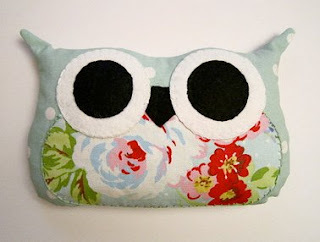 Jessica also makes cool phone cases, and bright and beautiful soft toys. Let's learn the story behind Feltgood..
Feltgood is a new craft venture by Jessica Molony - specialising in quirky wheat bags and any other handmade goodies that take my fancy! 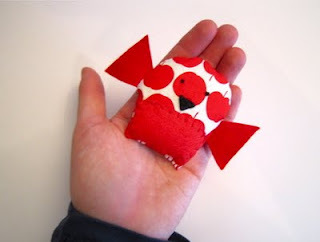 I have always been interested in handmade crafts - from making jewellery and accessorising hair-clips at a young age, to embroidery work and making anything with fabric. After completing a Bachelor of Commerce (Marketing), I decided I needed a creative outlet, so decided to study Interior Design and Decor at the Design and Arts College in Christchurch and then with having to recently leave my home (due to the earthquake) and move back in with my parents, crafting is a great and relaxing hobby to have! I am getting close to finishing my studies at the Design and Arts College in Interior Design and Decor - so I wanted to create something using gorgeous fabrics that could brighten up any interior space! At the moment I love anything to do with fabric and cotton! I love taking a piece of cloth and creating something that then has a spark of life. Currently.... A torch (because in Christchurch you can never trust when the power will go out! ), Orla Kielys ‘Pattern’ book, my trusty bedside lamp with a glowing red light bulb and of course... a ‘Ruby the Rabbit’ wheat bag! I find inspiration in magazines, books and of course, the internet! I love design and interior magazines - Urbis, Inside Out, Houses, Frankie... and lately I have been receiving a few books from Amazon - Orla Kiely, Pip Lincolne’s craft books, Cath Kidson... and I love losing myself in the internet and blog-hopping! From working at a fabric store, I am inspired by the lovely fabrics they stock and lately I have been checking out more markets and love seeing what other people have created! Anything design related - I also love hearing how other people do things, as I find their is never a correct/wrong way! Also how others have managed to turn their handmade business into a success! 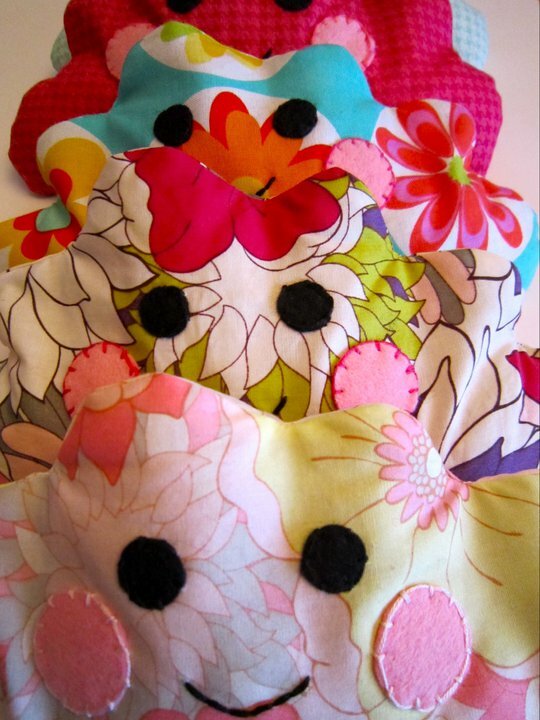 I would love to learn new skills and sewing techniques! Would also love to check out and perhaps sell at some craft markets in Auckland & Wellington - Would be great to see some more permanent markets and facilities set up in Christchurch's development. With the end of course approaching - I have assignments coming out of my ears, so they are still the top priority... just! I ensure I have time for my family and friends and my partner ensures I am off the machine at a reasonable hour and tucked up in bed! No real screw-ups here - although perhaps leaving the odd pin on the carpet is not so good! Luckily when my partner and I moved back into my parents, we were able to dominate the second storey and set up one bedroom as a shared office/study space.... which is now also being overrun with my sewing machine, piles of fabrics and the ironing board - I think he got the rough end of the deal! My current goals/wishes are to finish off my studies in August and find work either in the North Island or Australia. I hope to get more involved in the craft scene and want to ensure I can continue my sewing while balancing work, family and friends. I would also like to have a never ending supply of fabric on hand at all times... oh and perhaps my own complete full set of DMC embroidery cotton! You can view the full Feltgood range here. And check out Jessica's blog here. 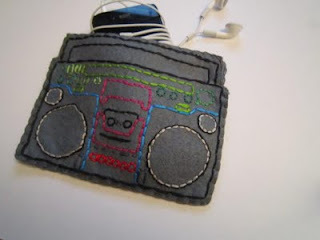 The boom box case is fab!